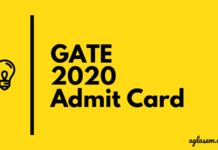 GATE 2019 Admit Card has been issued. IIT Madras has started GATE 2019 Admit Card Download on January 04, 2019, at 4:30 pm. Link to download the hall ticket is uploaded on this page. Exam center change notice for center code 4035 is released and provided below. 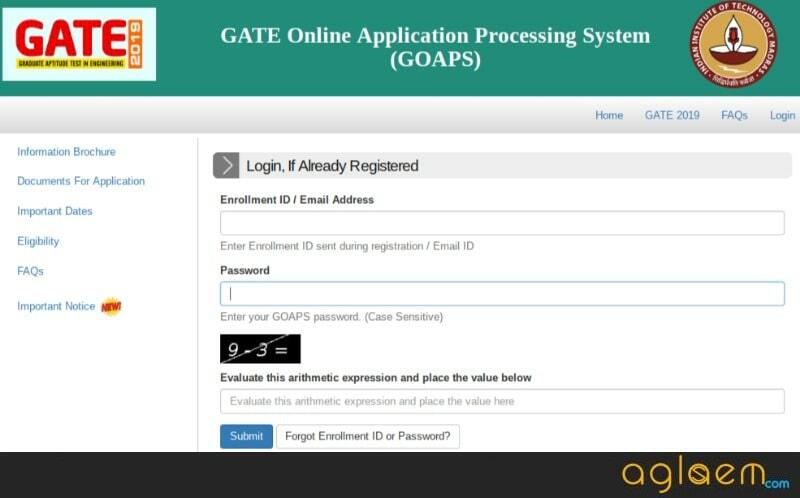 The GATE admit card is only released at GATE login, available at gate.iitm.ac.in. To download admit card, enrollment number or e-mail and password is needed. GATE 2019 is will be held on February 2, 3, 9, and 10 and admit card should be carried on exam day. 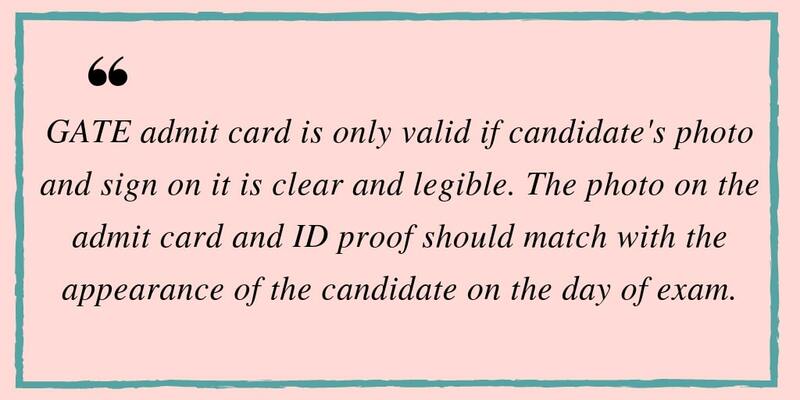 With the GATE Admit Card, the candidates will also have to carry 1 original copy of the photo ID proof. The ID to be taken should be the same as that used during registration. 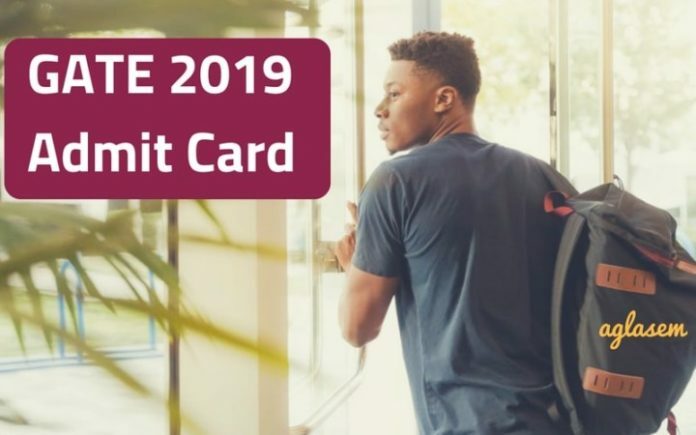 Check how to download GATE 2019 Admit Card, date and schedule, important documents and more information from this page. Latest: GATE 2019 is on February 2, 3, 9, and 10. Just like we provided you the admit card on time, we will GATE 2019 Answer Key as well. Step 3: Candidates now need to choose the 1st option. Following, this you will receive an OPT in the e-mail Id. A new window as shown below will also open and you need to enter Mobile Number and E-mail ID / Enrollment Number. Both should be as used during registration. Then. click on “Reset Password” button. Step 4: Now, to reset password, enter Enrollment ID, One Time Password (OTP), New Password and lastly, confirm new password. Now, your new password is set. Use it to download GATE 2019 Admit Card. 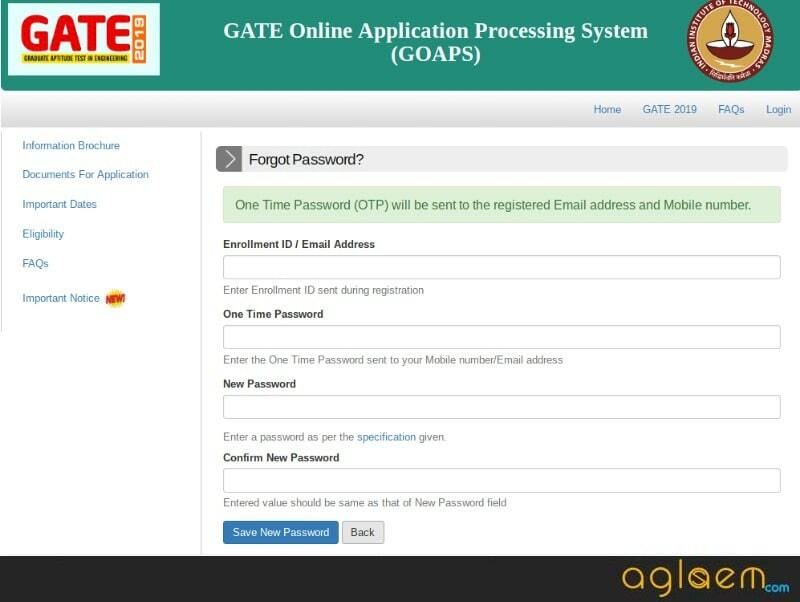 The process to download admit card of GATE 2019 is simple and candidate friendly. It can be done either on a phone or computer or laptop, with internet connection. Simple steps to download admit card are explained below. 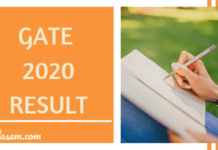 Step 1 – Click on GATE 2019 admit card link given above on this page. It will take you to a new window which will look as shown below. Step 3 – The login will open and there, candidates will have to click on “Download Admit Card” tab. Step 4 – On clicking the tab, the admit card will be downloaded as a pdf. Candidates should keep admit card safely until end of admission process. It is a very important document. It is important to realize that hard copy of GATE admit card is not sent by post or any other means. Therefore candidates should themselves check official website and this page frequently to download admit card as soon as it releases. It is very important to carry GATE hall ticket in correct format. Entry in the exam hall will only be granted if candidates carry the admit card in prescribed format. How to Carry GATE Admit Card 2019? 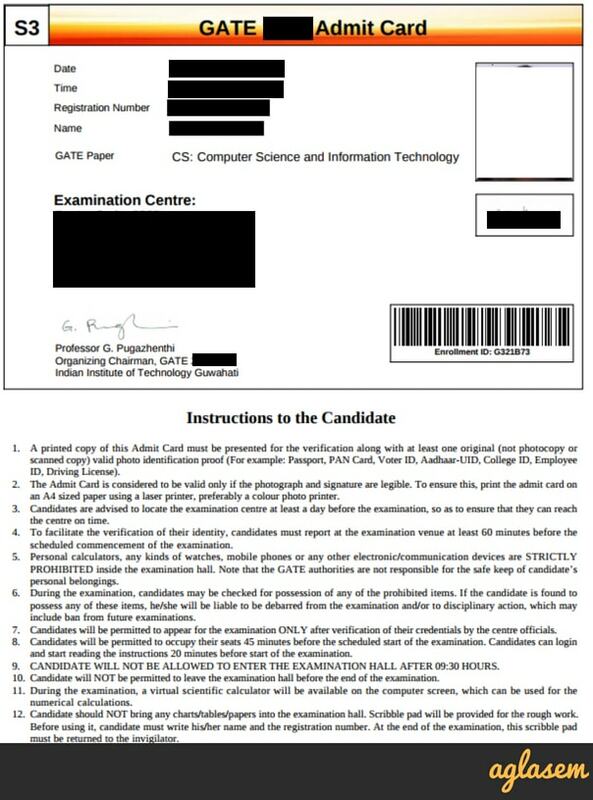 – Candidates have to carry hard copy of GATE admit card. Soft copy of mobile, laptop, etc is not acceptable. It is also advisable that the copy of admit card should be coloured. Admit card of GATE 2019 contains clear details of exam. This includes exam date, time, registration number of applicant, name, GATE paper, examination centre name and address, photograph, signature, exam day instructions. A sample admit card is shown below. Candidates are requested to follow discipline and maintain decorum in exam centre. Whereas a list of instructions are there in admit card, others that generally apply at exam halls should also be followed. GATE 2019 is a national level exam and any cases of unfair means are taken very seriously. Therefore candidates should not even think of deploying unfair means. Here is a list of instrictions to keep in mind for exam day. Candidates must report to exam centre on time. Otherwise they will not get entry. It is advisable to check exam centre location a day before exam. This will help candidates in reaching centre on time. After closing of reporting time, no one can enter exam hall. No one should bring any sort of paper to exam centre. All candidates will get scribble pad to do rough work in exam centre. They should return it to invigilator after exam. Candidates who are appearing for GATE exam can check out exam pattern here. It is advisable to prepare as per official exam pattern only. 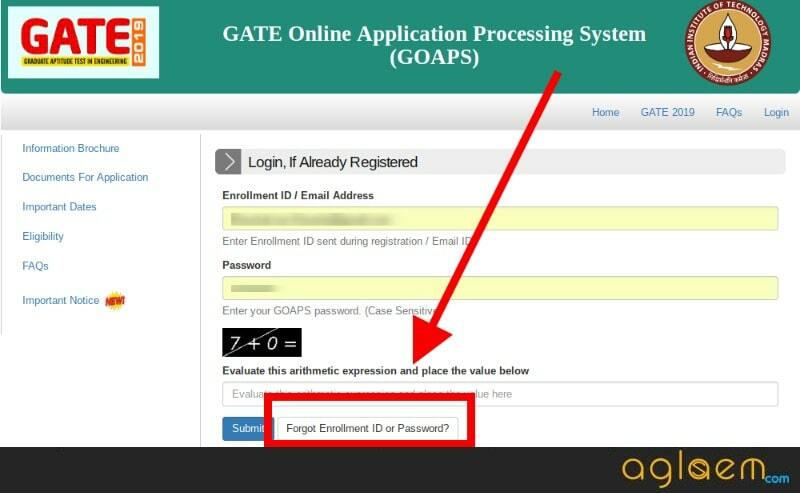 Here are some frequently asked questions about GATE 2019 admit card with their answers. Ans. Candidates are issued admit card as per schedule given above. No candiate is sent admit card by post. Therefore one must visit this page and official website as per schedule and download admit card from GOAPS. Ans. No, you should have admit card and valid ID proof. ID proof should be same as mentioned in application form. Ans. No. 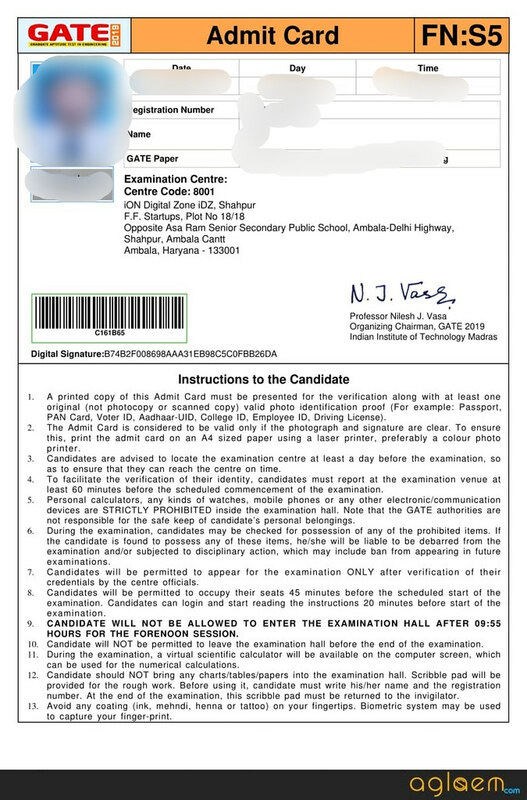 You have to bring printout of GATE 2019 Admit Card. The IIT Madras has published three lists at its official website. The first list consists of the name of those candidates who will not be issued GATE 2019 Admit Card because they submitted multiple Application Form. The second list consists of details of those candidates who will not be issued the GATE Admit Card 2019 because their application form has been rejected due to incomplete details/ late fee payment, etc. The Third list consists of the name of those candidates who are provisionally eligible to appear for the test and will be issued GATE 2019 Admit Card. Check the pdf below. How can I change it and recieve revised admit card. hey there sorry to say but nothing can be done now.